Can your business help others without expecting to be paid? Most entrepreneurs will not think so. After all, businesses are created to make a profit by selling a product or a service to a customer. 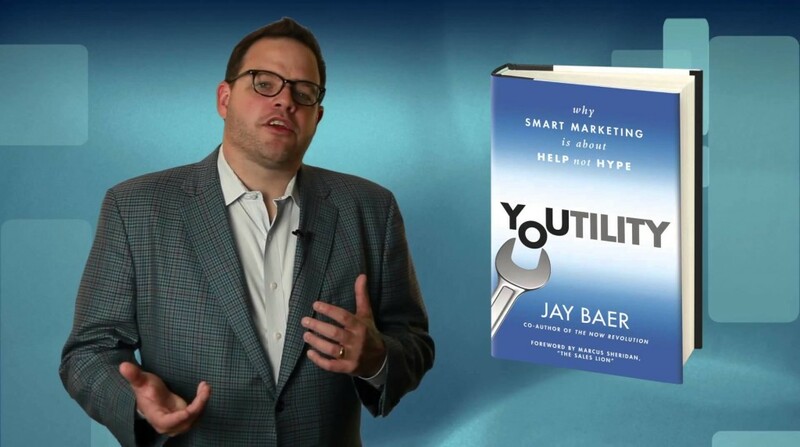 Well, Jay Baer, author of Youtility: Why Smart Marketing is about Help not Hype, doesn’t seem to think so. And if you read his book on content marketing, you’re likely to agree with him too. I first blogged about Jay’s notion of helpful marketing last year after hearing his engaging podcast on Copyblogger Radio. 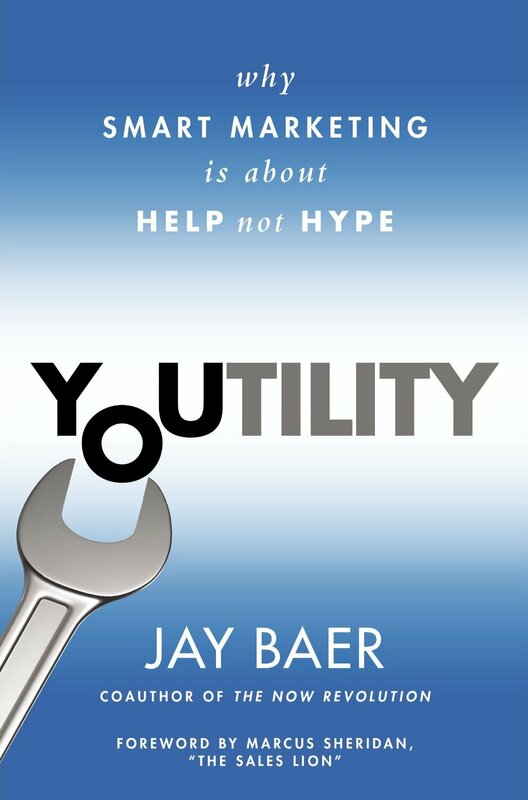 Since then, Jay has expanded his ideas into a full-fledged content marketing book covering both the theoretical and practical dimensions of what he labeled as “Youtility”. As highlighted in my earlier post, Youtility looks at how we should evolve from securing top-of-mind awareness (eg mass media ads) to frame-of-mind (eg Google searches) and ultimately friend-of-mine (eg recommendations by friends) awareness. In other words, it is the purest essence of content marketing. These days, your customers will prefer to help themselves to information prior to a purchase rather than talk to a sales person. Increasingly sceptical and cynical, they will want to look for externally validated sources of information before making a purchase. As a matter of fact, shoppers in 2011 need 10.4 pieces of information before making a purchase. This was a doubling of the 5.3 sources of information consulted in 2010 prior to buying something. Do you know that if you answer your customer’s questions in an open, comprehensive and detailed manner, you are more likely to win over their hearts and minds? In fact, the more information you provide, the better your chances of converting them to a paying customer. According to Jay, companies with websites of 101 to 200 pages can generate two-and-a-half times more leads than those with 50 or less pages. I guess these companies are deemed to be more trustworthy than the opaque ones. With the “app-ification” of the world, your customers will crave real-time information. Fortunately, you can serve them such information through mobile friendly content and apps. This is especially important in Asia with some 2.9 billion mobile subscriptions (compared to 969 million in the Americas). Use various online and offline tools to determine what customers need to eliminate their pain points. These can be anything from search engine results, social sentiment analysis, web analytics, survey results, focus groups to behavioural studies. Discern what the best channel and mode of delivering your useful content would be. These should consider the time, place and form in which your customers best prefer to consume such content. You should also consider the balance between providing them on singular versus multiple channels and platforms. To ensure that your Youtility platform is “findable”, you should seek ways to increase its visibility. Traditional ways include promoting your website link on emails, websites, advertisements, and stores, as well as engaging your employees to become your advocates. Usefulness should be a part of your company’s DNA. To win in this game, you need to involve a wide spectrum of your employees in creating such content. These can be done either circumstantially (on a need-be basis), voluntarily, with assistance (training and coaching), or by mandate (where it becomes part of the job). Whichever way you choose, you need to ensure that it becomes an instrumental part of your company. Considered a long-haul strategy, Youtility needs to be woven into the culture, policies and practices of your company. It needs to be embodied in the essence and soul of your organisation. Doing so helps your company to keep up with changing customer needs, shifts in technology and emerging superior ideas. Finally, you should develop a way to effectively measure how Youtility assists in driving your business performance. This is where it segues with digital analytics. Sales metrics like purchases (be it online or offline). Using a simple example in the book, you’ll be taught how you can calculate the ROI of Youtility. Here’s a more recent example of calculating blogging ROI by Jay Baer himself. Meijer’s Find-It app which allows shoppers to find products anywhere in the store using indoor mapping technology. You can actually find a similar technology here in Singapore with Y-Find technologies. Perhaps the most memorable story came from Marcus Sheridan of River Pools and Spas who wrote the forward for the book. Sharing how he overcame grave financial challenges in his fiberglass swimming pool business, Marcus sought to answer all the possible questions which potential customers may have and detailed them all in his website. This allowed him to achieve a massive US$4.5 million in swimming pool sales in 2011 with just US$20,000 in advertising, compared to US$4 million in sales in 2007 with US$250,000 in advertising. Written in a highly readable prose that you can’t help nodding your head over, Youtility provides simple yet refreshing ideas. In a world swarmed with marketing gurus instructing us to “change the world” and be awesome without an inkling of gritty reality, Youtility is like a breath of fresh air. Long time readers of my blog know that I love the idea of “giving to get” marketing. Much of what Youtility purports is very much in line with my personal beliefs. In summary, Youtility is a highly recommended book for anybody keen to embrace the new age of content marketing in the social age. Before you go, do also check out Jay’s blog where he regularly dishes out lots of useful marketing advice.